America’s first farm, where only robots will work, was opened in the hope of compensating for the lack of labor and produce more crops. Iron Ox estimates that the farm will be able to produce 30 times more production than regular farms. The industry is now experiencing big problems, which was the reason for attracting $ 10 billion last year. investment, which is 29% more than in 2016. There are two types of robots on the farm. The first lift and move containers throughout. 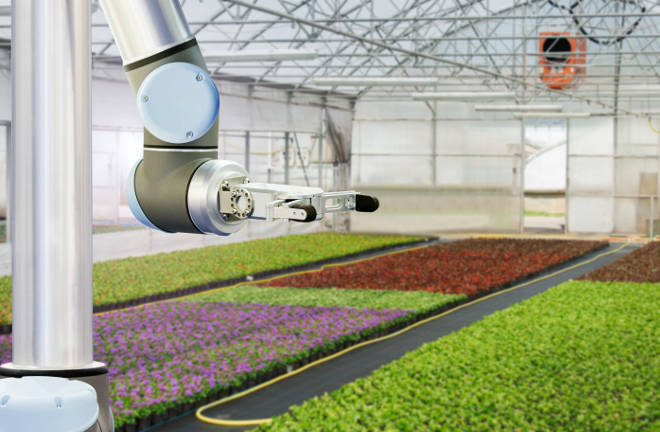 The second type is a “robot arm”, a machine that plants and transplants plants without causing them any harm. Also on this “hand” 4 sensors and two cameras are installed that allow you to monitor the condition of the plants. The development of technology of this level of accuracy at Iron Ox took years. Both robots collect data that is analyzed by the Brain, a cloud-based software that tells them when to act. “Every robot knows how to do work, but not when,” says Alexander. If robots prove their reliability and stability, then they are waiting for rapid adoption everywhere, as farmers are now looking for technological solutions. The idea of ​​Alexander was inspired by his grandfather, who constantly complained about the lack of manpower, changeable weather and long distances to move products. Alexander expresses his confidence that his project will be extremely successful, given all the difficulties facing the agricultural sector today. In his opinion, serious changes are required, and not measures that will increase productivity by only 5-10%. Iron Ox plans to sell its products to some restaurants and grocery stores in the San Francisco area already this year and expand its geography next year. The company also plans to open several new farms.